Nothing is worse than heating and cooling problems cropping up at your home or workplace at an unexpected moment. Even if you have a central air conditioning unit installed, let us face it – some rooms just do not get the airflow needed to dissipate the heat and survive the hot, sticky days of summer. Tower fans, in this regard, are a great option to increase air circulation in an efficient and affordable way. These fans can help keep you cool and improve the quality of the air in rooms where your central air cannot reach. With the solid air movement they provide, you can quickly cool down any room! Designed to be as compact as possible, these handy fans typically stand between 2-4 feet high when placed on the floor, but you can also position them on furniture depending upon where you need the air. They take up little space and easily fit in those hard-to-reach places, which is not the case with a large box or pedestal fans. In fact, some tower fans are so quiet that you might forget they were running. Moreover, some come with sleek, elegant silhouettes that go well with almost any room’s décor. So, want to avoid the heat this summer? Then, it’s about time you considered a tower fan to help you keep you cool! A variety of tower fans of different types are currently available in the market, so it isn’t easy to choose one that’s right for you. You need to think about your needs and how much you want to spend before you shop for a tower fan. 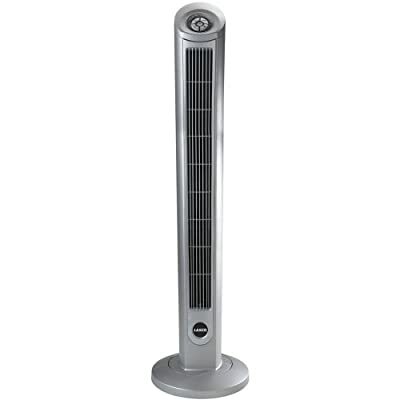 Although tower fans cost more than pedestal fans, they are more stable and less likely to tip over. Tower fans are very popular because they stand upright and take up very little floor space. A tower fan can be placed in a corner of the room, taking advantage of unused space. Most tower fans oscillate so that they can move cool air throughout the room. Many of them allow users to adjust the height, so the breeze is directed where it’s needed most. • Are you looking for a basic, affordable tower fan? • Do you want a high-end model with extra features like a remote control, sleep timer, and air ionizer? • Look for a model that’s large and powerful enough to cool your room. • Test it to see if it’s noisy. Read online reviews to see if customers have mentioned the noise level. • Does it offer multiple oscillation speeds and options? • Does the tower fan incorporate an air filter or ionizer to purify the air? • Does the air filter need to be replaced or can it be cleaned and reused? • Is the fan is made of a durable material that’s not likely to crack or break? • If you have small kids, check to see if the fan has soft blades and a grill in which their fingers will not fit. • A lightweight and a carrying handle are important requirements if you plan to move it frequently. • Check the store return policy and warranty before you make up your mind. 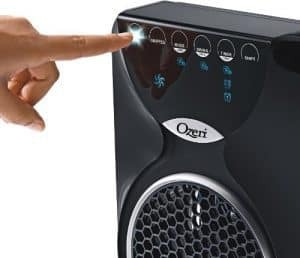 The Ozeri 3×44” Tower Fan has a visually appealing design, elegant glass base stand, and slim form factor, making it the latest in digital décor and stylistic innovation. Measuring less than 3 inches in thickness, this model from Ozeri is one of the thinnest fans in the world. The Ozeri 3x is equipped with canted blades that help to reduce blade noise. It features three independent controllable fans and has three fan speeds that provide nine different levels of cooling. It has a touch-sensitive LED control panel, and you can also control it using an extended-range remote control. It boasts 3 fans, which are independently controllable, with passive reduction technology and provides remarkable airflow without too much noise. The canted blades of the fan produce opposing sound waves that isolate the sound of the airflow and reduces blade noise. The 90-degree oscillation of this model ensures refreshing circulation of air throughout your room, and with a 7.5-hour timer, you can program it freely. The features of the fan can easily be controlled via the sensitive LED control panel or extended range remote control. Moreover, with a dismountable design, the tower fan’s base can be assembled easily, without any tools. This model offers powerful air circulation, is less noisy, and has the advantage of 3 independently controlled fans with 3-speed settings, among other impressive features, which surely makes it worth its high price tag. The Lasko 2551 Wind Curve Platinum is just right for a small living room or bedroom. This three-speed, oscillating tower fan features a wind-curve profile. It has a height of 42.5 inches that improves air circulation. A timer saves energy by allowing auto shut-off. It features an easy-carry handle and remote control storage on the back. This model is a 3-speed oscillating tower fan is quiet and powerful. It comes with an energy saving timer with automatic shut-off for up to 7-1/2 hours. Additionally, the patented and fused safety plug provides peace of mind as it prevents any electrical-related incidents. The Lasko 2551 also comes with a remote, and the easy carry handle allows you to conveniently take your tower fan with you whenever needed. If you prefer pre-assembled tower fans, you should go for this fan as you only have to attach the base to the fan, and it can be used right away. Most consumers feel that the air volume of this fan is less, but the air coming out is cool enough to quickly lower the temperature of the room. Since the fan produces less noise, it can be placed wherever you want, even while watching TV, as it will not cause any disturbances. In addition, with the remote control, the fan can easily be operated from a distance. Moreover, the fan also has buttons located on the top, which allows you to shift between features like start ionizer, change speed and add oscillation. The LED light, however, according to some consumers, can be quite distracting, especially in a dark room. All things considered, if you are looking for a Lasko fan, at a relatively cheaper price, you should give this one a go. The Honeywell Fresh Breeze is equipped with Turbo Wind generator blades that can move more air than typical blades. Its breeze mode simulates a gentle outdoor wind. It has a timer that can turn it off automatically after a certain number of hours. You can use the remote control conveniently from a distance. This fan from Honeywell is extremely lightweight as it is made from high-grade imported plastic. It offers three-speed settings to regulate the level of cooling and a timer function from 1-12 hours, which is useful if you forget to turn the fan off when you go to sleep or leave. Also featured is an electronic LED display with easy-to-use touch button controls, and a programmable thermostat to adjust the temperature according to your needs. The washable air filters make it easy to get rid of any dirt. The remote control with a built-in flashlight is another noteworthy feature. The temperature control offered on this fan is unique as it almost behaves like a thermostat of an air-conditioning unit. All you have to do is set the temperature, and the fan will continue to run until the temperature is finally achieved. Isn’t that convenient? You do not have to get up in the middle of the night to turn off, as it will shut down automatically once it reaches the set temperature. Moreover, the airflow oscillates in a wider span and is higher than other similar fans in this price category. The only downside, as reported by most consumers, is that that fan makes more noise when operating in Breeze mode. 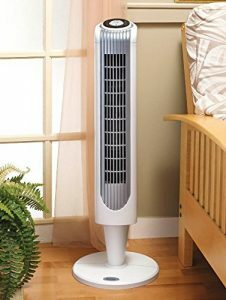 Overall, the Honeywell Fresh Breeze takes less space up in the room, and provides consistent, cool air once kept away in a corner, making it a definite buy if you are looking for a tower fan with good features at a modest price tag! The Honeywell HY-280 QuietSet is simply one of the best tower fans available on the market. While it has all the features you would probably want in a tower fan, its main selling point is how quietly it operates. Once turned on, you can barely hear the air blowing out of the vents. This model also comes with distinct breeze and oscillation settings, making it extremely simple to use. The Honeywell QuietSet has eight speeds and operates quietly, which makes it perfect for use in a bedroom. It features a temperature control that allows you to set a temperature at which it turns on automatically. It also displays the current room temperature and is equipped with a timer that can shut it down automatically. Since the fan has a remote control, it can be controlled without leaving the comfort of your bed. It also allows you to monitor the speeds with ease. The Honeywell HY-280 offers users 8 different speed settings, so you can determine which speed best suits your needs. Its convenient carry handle enables you to take the fan with you wherever you go. Nobody wants to own a noisy tower fan. However, with this tower fan from Honeywell, you do not need to worry about needless noise as it virtually sounds the same, whether it is on or off – it is actually that quiet! When it comes to design, the fan takes up little space. It is made of hard plastic, so rest assured it is capable of withstanding wear and tear. To sum up, the fan offers 8 different levels of cooling and is also Energy Star approved, which makes it a must-buy if you are looking for a tower fan with maximum comfort, minimal disruption, and unbeatable energy efficiency! This tower fan stands 36-inch tall in height, which allows it to cover a larger area than other fans in the same price category and offer better airflow. With its slim design, automatic shutdown timer and quiet operation, it is an ideal tower fan for your home. Moreover, since it comes with a remote control, you can easily control its multifunctional control panel from a distance. The Holmes Oscillating 36-inch tower fan features three fan speeds. It operates quietly, so it’s just right for use in living rooms and bedrooms. You can control it using a top-mounted control panel and it also comes with a remote control. It uses 60 percent less energy than comparable tower fans, and its integrated carry handle makes it easy to move. This model also offers time options and three-speed settings to choose from, enabling you to customize the cooling of the fan according to your needs. When turned on, the fan fills your rooms with cool air, thanks to its powerful breezing mechanism. All you have to do is set it in a corner, and rest assured it would get the job done right. At night, its sleep mode will enable you to generate additional savings. Simply set the shutdown timer, and you can enjoy the fan’s cooling effect throughout the night. For many consumers, this fan has proven the best heat-relieving equipment, which speaks volumes of its efficiency and dependability. Overall, with its compact design, this tower fan can easily fit in any corner of your room. It has a powerful oscillating functionality, enabling it to cover even the largest of rooms with ease. Sure, it may be a bit pricey, but it is one of the most effective fans available on the market. If you are looking for a high powered fan that does not take up too much space, this fan is a perfect choice. The Ozeri Ultra Wind is a quiet 42-inch tower fan that can move large amounts of air with little noise. Its sophisticated, space-saving design will go well with your home décor. It features three programmable airflow patterns designed to enhance comfort, relaxation, and sleep. There is also a 12-hour timer and an easy-to-use remote control. The Ozeri Ultra 42-inch Wind Fan is a top-of-the-line tower fan that will cool you off in a matter of minutes. This contemporary fan functions quite well and throws a powerful breeze without being too noisy. This model comes with a remote control stored, which is stored in the fan, making it easily accessible whenever needed. This model from Ozeri offers a range of impressive features. It is equipped with a 12-hour timer, 3 preprogrammed air patterns, 3 whisper-quiet speed settings, 90-degree oscillation to facilitate optimal air circulation and temperature display that is illuminated on the multi-colored LED screen of the tower fan. All of the fans features can easily be activated via the built-in control panel or enhanced-range remote control. When it comes to design, the sleek and slim structure of the Ozeri Ultra 42-inch Wind Fan allows you to place it in any area of your rooms. It provides great airflow and distributes the air throughout the room equally. The remote control of this tower fan works great, and unlike other fans, is not bulky so it can be handled with ease. The oscillating effect of this tower fan is exceptional as you can move at a 90-degree angle, which covers the largest rooms. However, the only downside, according to consumers, is that the fan tends to move a little when placed on the floor or carpet as it is made of plastic. Overall, the fan is easy to operate, has a sophisticated design that will complement the décor in any room, and most importantly of all, the wide range of benefits it has to offer is not too bad for the price! The Lasko 4000 Air Stik has an ultra-slim design that makes it perfect for small rooms. It can even be used on a desk, and it is so quiet that it will not disturb while you are working. It features LED-illuminated electronic controls and has two-speed settings. It is supplied fully assembled, so you will not have to put it together. 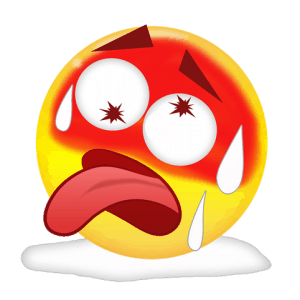 Sometimes you just want a fan that works well, that is all, nothing too fancy or with various kinds of buttons, a fan that cools your room and does not cost you a lot of money or makes you feel insane trying to operate it. If you want this, the Lasko 4000 is just the tower fan you need! This easy-to-operate tower fan is affordable and simple to use but throws out cool air to spread throughout every corner of the room. It is only 14 inches tall, making it the perfect choice for a kitchen table or desk to meet the cooling needs of a couple of people. Moreover, it comes with only two-speed settings and no matter which setting you choose, high or low, rest assured a steady, cool stream of air would continue to flow for your comfort. The fan also features LED illumination, which allows you to easily change the speed settings, view the room temperature, and more. While some consumers say the illumination is a tad too bright in darkness, most people have not found it to be worrisome. 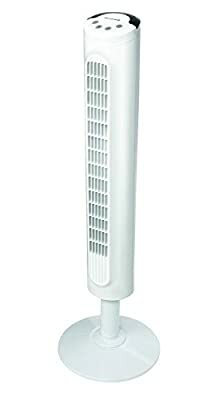 As far as looks are concerned, this tower fan is made of high-quality plastic and features a slim tower design. Available in gray, the fan is delivered to you fully assembled, so you can start using it right away. If you are looking for a tower fan that is budget-friendly and will exceed your expectations, you should definitely consider the Lasko 4000. This exceptional tower fan will provide you the cool air you need and more, minus the unnecessary frills! The Holmes 31-inch Oscillating Tower Fan comes with an elegant, slim tower design that offers optimal performance while taking up minimal floor space. With its powerful airflow and lightweight, this tower fan is one of the best all-rounder fans available on the market. It features a fully functional control panel that lets you access three-speed control settings (low, medium and high), 2-hour auto shutdown timer and oscillation control. Designed for efficient and quiet operation, the Holmes 31-inch Oscillating Tower Fan is ideal for the workplace or home use. With its remote control, you can control the fan from a distance. Moreover, the integrated carry handle allows you to easily place your tower fan wherever you want. The 3-speed settings combined with motorized oscillation provide consistent airflow in large rooms without any problems. Overall, this tower fan from Holmes can quickly cool up your room, and with its controllable oscillator, the air can be adjusted to your needs. It also possesses the features you look for in a tower fan and is powerful enough to compete with other fans on the market, making it the ideal choice if you are on a low budget. The Honeywell HYF023W Comfort provides excellent cooling with little noise. It features three speeds and easy-to-use electronic controls with an LED display. The recessed carrying handle makes it easy for you to move it. It is a great choice if you are looking for an affordable tower fan that cools well and runs quietly. The Lasko Xtra Air is a quiet, powerful tower fan that can cool your room quickly. This 48-inch tall unit has lighted controls and comes with a multi-function remote control. It features a fresh air ionizer, a timer and a handle that makes it easy to move. You can assemble its base easily before use. 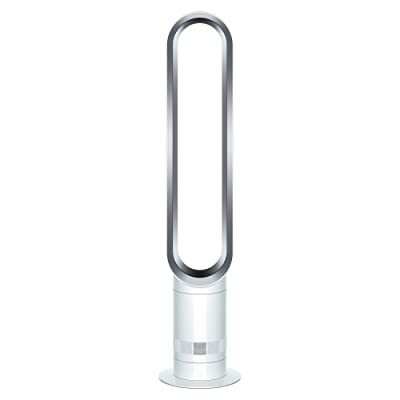 The Dyson Air Multiplier is a quiet tower fan that takes up little space. This energy-efficient fan will help you to save on your utility bills. It features a sleep timer that can be programmed to turn it off automatically after a certain period of time. It comes with a remote control with 10 airflow settings. When talking about size, we do not mean the size of the tower fan, but rather the size of the room you are going to place it in. Depending on how big the room is, choose a tower fan that has the appropriate power to cool it consistently. For instance, a high-powered tower fan is capable of circulating more air, making it the ideal choice for big rooms. If you do not want to spend too much money on electric bills, you should opt for an energy-efficient tower fan. Look at the energy consumption of the fan to determine which would best suit your needs. In fact, some models come with sleep timers or automatic shutoff, enabling you to reduce energy consumption. When you make an investment, whether big or small, you want the product to last as long as possible. Therefore, you should pay close attention to the materials the tower fan is made from. The models that are made of plastic are more likely to crack or break. So, if you are planning to use the fan on a regular basis, go for one made from metal or stronger plastic. Most tower fans offer multiple oscillation speeds. While some simply move from right to left, others oscillate up and down as well. It all comes down to your needs. If you want a tower fan that can oscillate in different directions, you will be glad to know there are a number of options on the market with these capabilities. Finally, you would not want to buy a tower fan that is too noisy during operation. After all, it could distract you while you sleep, read a book or watch TV. Since you cannot always test the tower fan yourself, the best thing you can do is to keep yourself well informed about different the models you are interested in before you go shopping. Why Do I Need A Tower Fan? Sometimes a tower fan for your home or business is a perfect fit. Why may you ask? Well, the truth is on occasion you really do need a ceiling fan to help cool down a particular room in your home or office. Other times you only need some air movement, and nothing will provide it better than the best tower fan money can buy. This article will cover what a tower fan is, what it does, the advantages of using a tower fan, how to find the best tower fan, tower fan prices, and what other users have to say about its performance. A tower fan is a lot like those circular oscillating fans or the cheap box fans sold in a hardware store. Ceiling fans sit up there high above everything and spin, and spin, and spin; they also make noise. And once in a while, you can get a ladder and damp cloth, and clean the dust off the blades. On the other hand, with a tower fan, instead of spreading the airflow out over a wide area. The tower fan condenses the air movement in a vertical manner. Ergo, if you’re sitting in front of a tower fan, you’ll feel that blast of cold air. * A thermostat allowing you to run the unit only when needed. * Variable fan speeds with up to five different choices meaning you can customize the tower fan experience you want. * The tower fan has timers where you can set up to 71/2 hours in 30-minute increments. Ergo, you can have the tower fan unit shut off automatically. * Finally, here is the feature that tower fan buyers love. It often has remote control access, so you don’t have to get up, sit back down, get up again, and interrupt your reading or movie just to change the fan speeds. One of the direct advantages of owning a tower fan, compared to the “ceiling spinners,” is its complete portability. It is also simpler to maintain due to easy access as compared to a ceiling fan. Most tower fans are lightweight, making it easy to move around. Tower fans can be picked up, moved, and they even have long cords that make it easier to place around the move. Another advantage is that you can hardly hear it running. Some of the better tower fans have a rating below 60 decibels that means you can carry on a reasonable conversation even if you are directly in front of the fan; nor will you have to turn the volume up on your TV to hear what they are saying. In places where the sun shines constantly (think: Arizona, Nevada, Florida, California) and your only cooling is a couple of those noisy “ceiling spinners” who knows how much energy is used? Tower fan reviews have shown the tower fan is not only quiet, it’s extremely energy efficient. So, when you make your purchase, look for the “ENERGY STAR” ratings to ensure you are buying the best tower fan. Also, the fan won’t dramatically impact your utility bills. You can run and run and run them if needed because the fans are permanently lubricated. The tower fan is also much more energy-efficient to cool than the usual suspects. Note: Tower fans have filtration and ionization filters that can be included with your purchase. The filters are removable and keep the allergens in your neighborhood, from pets to pollen, to make breathing easier. And since ionization helps freshen the air around you in a natural way it leads to a more hygienic atmosphere in your home or office. Tower fans are lightweight and can easily be moved from one place to another. They offer amazing cooling capabilities at an affordable price and can be used for a wide variety of applications (i.e. at home, school, workplace) to kill the heat and help you stay cool. However, note that the tower fans we have reviewed in this article are considered the best by thousands of consumers on Amazon, but let’s face it, choosing one comes down to your needs and the features you are looking for! With a vast assortment of tower fans available on the market, each with their own design and features, it is important that you assess your needs beforehand and compare them against the specifications of the tower fans you are interested in. By doing so, hopefully, you will be able to find the best tower fan for your needs to keep you and your family cool in the hot, sweltering days of summer!